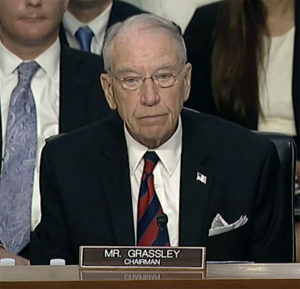 Senator Grassley during last week’s hearing. Senator Chuck Grassley drew chuckles from an audience in Atlantic this morning after he was asked about New Jersey Senator Cory Booker’s White House ambitions. A GOP senator on Grassley’s Judiciary Committee openly accused Booker, a Democrat, of using last week’s confirmation hearing for a U.S. Supreme Court nominee as a springboard for a presidential campaign. “A lot of my colleagues said so and I may have thought so, but I’m not going to say that stuff in committee. I mean, we’ve got enough problems,” Grassley said, evoking laughter from the group. Grassley is chairman of the Senate Judiciary Committee. Booker, who is also a member of the committee, is scheduled to speak at the Iowa Democratic Party’s annual fall fundraising banquet on October 6, further stoking speculation he’s plotting a run for president in 2020. Grassley said today it was “very appropriate” for Booker to quiz Supreme Court nominee Brett Kavanaugh, but Grassley accused Booker of misleading the public about an email Kavanaugh wrote. Booker has said the public has a right to see documents that show Kavanaugh’s record when he worked in George W. Bush’s White House. Grassley met privately with members of the Southwest Iowa Planning Council in Atlantic this morning, then had a brief question-and-answer session with local media.